On 14 October Cardinal Vincent spoke at the midday Vatican press briefing on the synod on the family. He spoke initially about the interplay between the plenary sessions of the synod and the small group discussions which he feels gives the synod process more energy and creativity. In his small group, Cardinal Vincent explained that they have begun to be friends, not just colleagues. Answering questions from journalists, the Cardinal said that he hoped that Pope Francis would produce some form of Magisterial document after the synod. He believes that the Pope has established the Jubilee Year of Mercy precisely to create the context into which his reflections and statements about the theme of the synod can be received. He went on to answer a question about his statements on the need for deeper reflection on the relationship between mercy and justice. 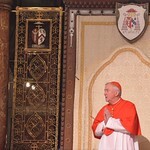 Cardinal Vincent explained that his small group had focused on two paragraphs from Misericordiae Vultus, the Papal Bull of Indiction for the Extraordinary Jubilee of Mercy, where the Pope explores this idea. Cardinal Vincent also emphasised the contribution of the Church in other continents during the synod. He highlighted in particular the testimony of the African bishops who explained the African experience of marriage as something that takes place between two families, not just the individuals. This gives a richer concept of the social position of marriage and the resources of two families trying to help a young couple establish and mature. In Western countries, there is a tendency for the couple to view the marriage ceremony as a private event, and not for the wider parish. Responding to a question asking whether there were any stalemates at the synod, Cardinal Vincent stated that this was not his experience but that there is an energy, and although there are differences of opinion, there is a sense of willingness to explore in depth these difficult issues together. The most recent small groups reports are available to read in their original languages here.